Here is the big one: Hegel’s top of the tree. The H590 from Hegel Music Systems is not only the biggest integrated amplifier the company has ever produced, but it’s also the most connected, the most forward-thinking, and – in outright performance terms – probably its best yet. Granted there are a couple of pre/power combinations in the line-up that might have something to say about that (especially the 1,100W H30 mono brutes), but I’m holding to that statement. The H590 is the synthesis of the best of the latest line of integrated amplifiers (such as the innate flexibility of the Hegel Röst and later designs), coupled with the most up-to-date versions of all the amplifier technologies Hegel has incorporated into its amplifiers for the longest time. Now mix in the kind of ‘best in show’ components and technology so new it gets its first outing here and you have an unbeatable combination. The Hegel H590 adds more power to the likes of the Röst, H90, and H190, and it brings more power and connectivity to the H360. With its strangely precise 301W per channel, you could be mistaken for thinking the H590 occupies the top slot of Hegel’s integrated amp line-up simply by virtue of power delivery. If you need a bigger amplifier and the H360 won’t cut it, then the H590 is all you need. While true on the surface, this is too simplistic a reading of the situation. 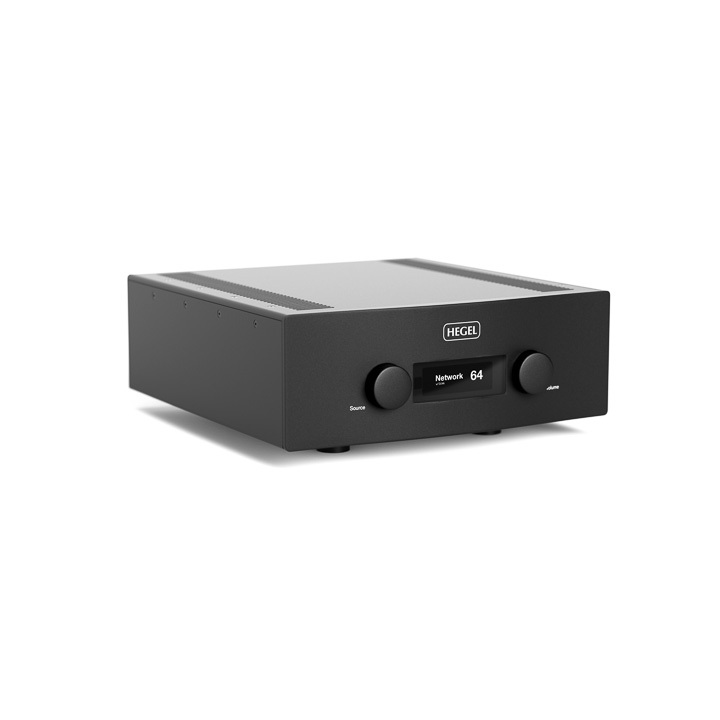 Interestingly, the price of the HD30 flagship DAC from the company and the H360 is not that dissimilar to the full-up H590, and until this model shipped, this was probably the best Hegel set-up you could buy. The H590 effectively obsoletes that combination, as you won’t buy both when the H590 performs this well. Like the other integrated models in Hegel’s line-up, the H590 features an extensive onboard digital audio section and analogue inputs. Unlike those other integrated models, however, the H590 does not place limits on either in order to fit on the back panel. So, you get a trio of stereo RCA line inputs, and two sets of XLR balanced line inputs (as well as fixed and variable RCA stereo outputs) on the analogue side, and two coaxial (one of which uses BNC), three optical, USB, and Ethernet digital inputs, and even a BNC coaxial output. That is an exceptionally comprehensive line-up for an integrated amplifier, reflecting the does-it-all nature of the Hegel H590. There are a couple of obvious omissions, however; no phono stage and no headphone socket. The first is perhaps more understandable than the latter, as Hegel has long eschewed turntable as one of its regular sources, preferring instead to allow the end user to specify their own analogue front-end. While those seeking an all-Hegel electronics solution that includes turntable replay might want a standalone phono stage from the brand, the onboard equaliser in an amplifier is now a rarity. The absence of a headphone socket is more odd, as Hegel makes an extremely good headphone amplifier circuit in its own right on all the other integrated models in the line-up. Hegel is extremely adept at reading the demands of its customers, however, and I suspect the absence of a headphone amplifier is no accident. Hegel’s design criteria is reduced to a series of pithy names that aptly describe aspects of the technology, including the localised feed-forward amplifier circuit called SoundEngine, DualAmp (which separates out the voltage and current gain stages) and the related DualPower (which provides specific power supply feeds for those separated parts of the amplifier circuit), and finally OrganicSound that requires careful voicing of the amplifier against a known reference of acoustic instruments and vocalists not known for their love of AutoTune. There are a similar group of names for the digital audio side of things, including SynchroDAC (synchronised – as opposed to asynchronous – upsampling) that goes with the company’s LineDriver technology (high-frequency filtration), a similarly synchronous USB technology, all controlled by pico-second accurate MasterClock. All of the technologies underlying these names have been improved in the process of developing the H590, and you can hear this.